Walther PPKS .380 ACP Mec-Gar 7 Shot Magazines Blue Steel Finger Rest 380 PP WPPKSFRB Buy 3 Ships Free! Description: NO MAGAZINE SALES into NEW YORK CITY. CONNECTICUT residents must furnish us a copy of your CT Eligibility Permit or ammunition certificate. This listing is for ONE magazine. Buy 3 Ships Free: Combine any 3 of our non gun non ammo listing lots, and the entire order ships Free! 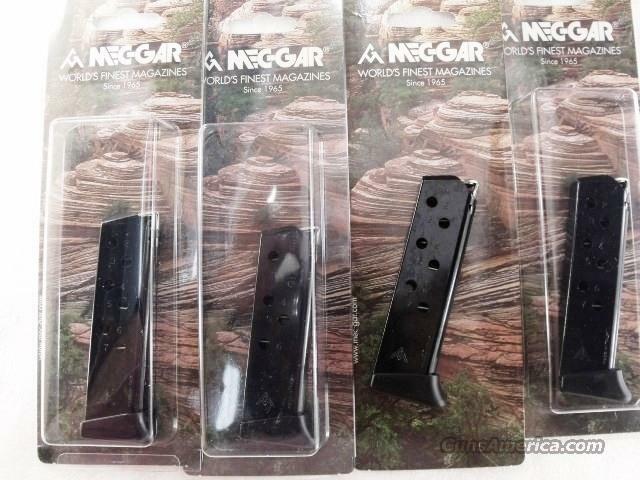 Photos show brand new Mec-Gar Magazines, part number WPPKSFRB, for the Walther PP and PPK/S .380 caliber pistols with the longer grip frame than their PPK siblings. These magazines will fit and work in a PPK, but they will protrude from the shorter gun’s grip frame. Manufacturer is Mec-Gar s.r.l. of Brescia, Italy. Importer is Mec-Gar USA of Middletown, CT. Construction is blue steel body, with nickel plated steel followers and high impact polymer, finger rest type floorplate. Each magazine holds 7 rounds of .380 ACP ammunition, 9x17 or 9mm Kurz in European terminology. Mec-Gar, by the way, is the manufacturer for currently produced Walther pistols, so except for the finish, these magazines are the same as factory Walther issue mags. Replacement pricing on factory Walther mags is $50 apiece or more in many places. We’re offering the Mec-Gars in the photos, however, or their identical mates, each	for only	$ 26.00. Buy 3 Ships Free!